All eyes on you: These glitter-encrusted leather oxfords are the ultimate statement-making dress shoe. Whether it's for the holidays, a special occasion such as prom, or simply for a night out, these eye-catching shoes are essential for elevating your entire outfit. 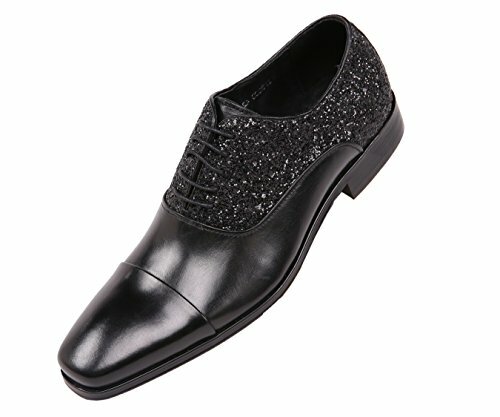 This classic cap-toe oxford silhouette is excentuated with a glitter topline. Giving this timeless look a serious update. Choose from a dazzling array of colors, including black, navy blue and gold/black to easily coordinate with any look and fit any occasion. Take your look to the next level and add some major star power to your next night out on the town with these high-shine shoes. If you have any questions about this product by Asher Green, contact us by completing and submitting the form below. If you are looking for a specif part number, please include it with your message.